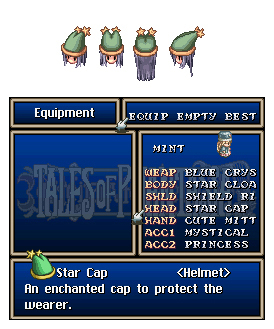 the star cap was a headgear in "tales of phantasia". i really liked it so i tried to make a ro headgear of it. the picture below is a actual ingame screenshot of ToP. one perspektive is missing, i know. May I use this for my Petit Dragon? XD"
i actually dont like this one, its quite cheap, but its the first sprite edit i ever made, almost 3 years ago now. nothing special here, i just made her sit a bit different. i drew an assasin sitting lke this. i never finished it, though. its a bad habit of me to leave things undone. anyway, i wanted to let the sprite sit like the assasin in my artwork, thats why i made it. i'm sorry about the oversized and useless gray background. i wanted to make a sig with this sprite but i gave up on it, so this is just the test animation, and i was too lazy to cut the background. you'll survive looking at it, though. not much to explain here either, priestess with another palette, a sword and a scale. i made sneakers, am i special now? you dont want a description, belive me. lol, nah, i dont want to let anyone blush. you gotta live with the description it has.